Health challenges in low income countries is the theme of this years’ Global Health Day. The is seminar organised by The Faculty of Medicine at NTNU, Sør-Trøndelag University College and St. Olavs University Hospital. Professor Staffan Bergström, Karolinska Institute. Specialist in Obstetrics and Gynecology. Staffan Bergström has experiences from several African countries on how to save mothers and newborns in places where there is a shortage of doctors. He points to the importance of health workers without medical training. 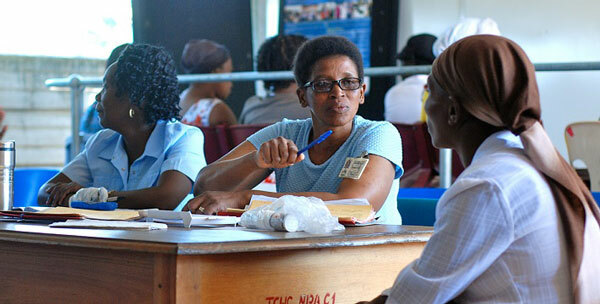 It is they who are the backbone of health care system in low income countries. Dean Sylvia Kaaya, School of Medicine, Muhimbili University of Health and Allied Sciences (MUHAS) in Dar es Salaam, Tanzania. Silvia Kaaya is professor of psychiatry. Her research interest is children and mental health. Professor Kaaya’s publications trades extensively to detect and treat mental illness and depression in different groups e.g pregnant women, children, youths and how HIV positivity affects mental health. Recently NTNU and MUHAS signed a MoU in research and student exchange. Professor Charlotte Watts, London School of Hygiene and Tropical Medicine, UK. In the mid-90s Charlotte Watts did her fieldwork in Zimbabwe. The findings from her study illustrates not only the extent to which violence against women is widespread throughout the world, but also that there is considerable variation in the levels of violence – both within the country as well as between countries. Although the causes of violence are complex, this suggests local variation and that there may be local conditions that affect the extent to which women are subjected to violence. A better understanding of the causes of this variation can be used to identify how to prevent future violence. The seminar, lunch and pizza are free. Please register for the seminar before 10 October 2014. The target group are persons engaged in research, teaching or clinical activities targeted towards developing countries as well as students in health sciences or medicine. Global health research embodies research on health problems related to challenges that particularly affect people in low- and middle income countries. The Faculty of Medicine, NTNU, has increased its investment in global health, in close cooperation with St. Olavs University Hospital, Sør-Trøndelag University College (HiST), as well as partner institutions in low- and middle income countries. The seminar aims to increase cooperation, networking and further research activity while providing professional input and inspiration. The Research Council of Norway has given financial support to this seminar. Technology for a better world? Why study chronic intestinal inflammation? Furry and fit: get moving this Movember!